Thailand’s embattled coach of the national taekwondo team apologized over the punishment used against a badly prepared female fighter, but said he would not change his methods. South Korean-born Choi Young-seok told a packed room of reporters Monday that what he did what about instilling discipline in the entire team. He said he would not resign and wanted to make the Thai team his last, informed the Bangkok Post. Team member Rungrawee Khurasa, 23, accused coach Choi of using excessive force by punching her several times after she lost a match at last week’s Korean Open. The coach said the accusation, which went viral on social media, caught him by surprise and he wanted to apologize to the Thai people for the controversy in hopes of putting the matter to rest quickly. Coach Choi, however, said he would not change his punishment methods. Team discipline needs to be improved and fighters need to understand his system better, he told reporters. Explaining his discipline philosophy, coach Choi said that results of any individual match are not as important as the skills that can be developed. But fighters on the national team need to learn to take responsibility. In the case of Ms. Rungrawee – who not only lost the match due to bad preparation, but also forgot an identification card and kept an opponent waiting – coach Choi said the punishment was dealt because, although the open was a small event, if it were repeated at the Asian Games, it could bring disgrace to the country by being disqualified. No one is disputing that coach Choi struck the young woman. The question has been over whether the force used was excessive. The coach earlier described the punishment not as the “punch” the fighter described, but light, open-hand contact. 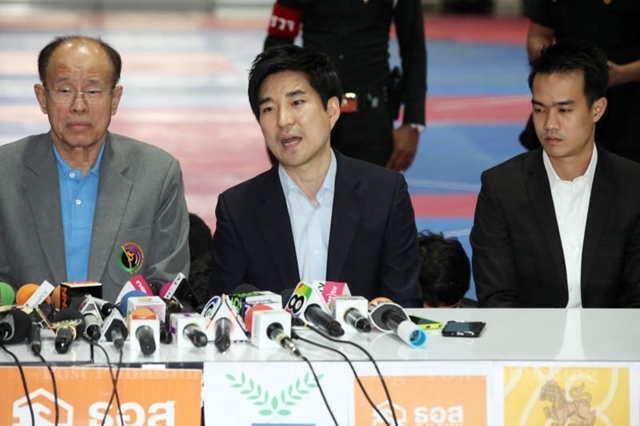 He told the large media contingent covering his arrival that he didn’t fault taekwondo athlete Rungravee Khurasa (or “Nong Koi”) whose allegations of excessive punishment after her loss at the Korea Open caused him to briefly consider resigning his position. He said she simply lacked experience in what was required of a national team member and the demands of international competition. “She has only been a national team member for three to four months and doesn’t really understand team regulations,” Coach Choi said. He said he would like to quickly come to an understanding with Nong Koi so the matter can be laid to rest and he can get back to his duties as coach. At the airport, Preecha Tortrakul, head of the Taekwondo Association of Thailand, said his organization was willing to give Nong Koi the opportunity to continue in the sport. She had earlier announced she was quitting the national team. Mr Preecha also announced that Coach Choi would continue training the national team through the 2016 Olympics in Brazil. Choi at the Press Conference at his arrival to Thailand, today.